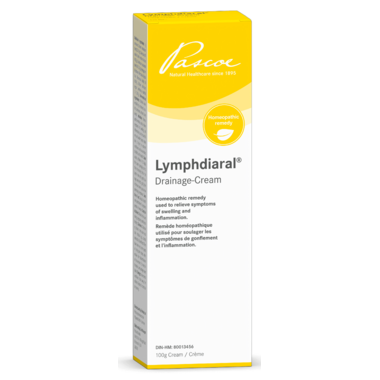 Pascoe Lymphdiaral Drainage Cream is a homeopathic remedy used to relieve symptoms of swelling and inflammation, such as pain, fever, and swollen lymph nodes due to injury or recurrent conditions such as earaches, tonsillitis, and sinusitis. Directions: Adults and children (1-12 years old): Apply the cream sparingly one to three times daily, first in the lymph node drainage area (neck, groin), then in the area where you are experiencing symptoms. Caution: LYMPHDIARAL® Drainage-Cream should not be used during pregnancy and breastfeeding. Cetostearyl alcohol may cause local skin irritation (e.g. contact dermatitis). Side Effects: There have been very rare reports of itching skin rashes, which resolve after discontinuation of the ointment. If you experience any side effects not included in this leaflet, please be sure to inform your doctor or pharmacist.